It was double joy for CHIJ Katong Convent’s Jannah Wong Min as she sets two consecutive records enroute to win the ‘B’ Girls 100m hurdle earlier today at the 52nd National Inter School Track & Field Championships 2011. The 15-year-old was clocked at 14.92 seconds during the morning heats, and later on during the afternoon session she went on to hurdle even faster, breaking her own half-day old record with a new time of 14.85 seconds. Jannah, who is currently coached by Mr Lim Tian Quee, was in a class of her own with her 3-step hurdling technique, where the young promising hurdler has been winning divisional title since 2008. She moved up a division this year to ‘B’ girls, after capturing the ‘C’ girls 80m hurdles title last year, no less in record winning time also. 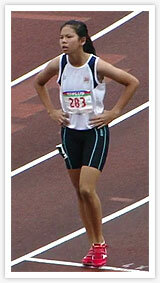 Previously the ‘B’ girls 100m hurdles record was held by Singapore Sports School’s Goh Wei Ning. The old mark stood at 15.00 seconds set last year.